The FM489 is a high performance PMC-X or XMC module dedicated to data acquisition, processing and communication applications with complex requirements, offering two FPGAs: the Virtex-4 and the Virtex-5. BLAST™ is an innovative and modular technology for the newer high performance FM489 PMC-X and XMC modules. BLAST™, Board Level Advanced Scalable Technology, is a small PCB module that allows customization of the FM489 in memory extensions, processing units and communication interfaces. Each FM489 can be populated by up to 3 BLAST™ modules or none at all. The User Programmable Virtex-5 is directly connect to three BLAST™ sites which bring out 100 lines of single-ended I/O from the Virtex-5. Customer may selected at time of order 1, 2, or 3 BLAST™ sites loaded with the below BLAST™ Modules. Or, depending on memory requirements, BLAST™ sites may be left open and no BLAST™ mounted. 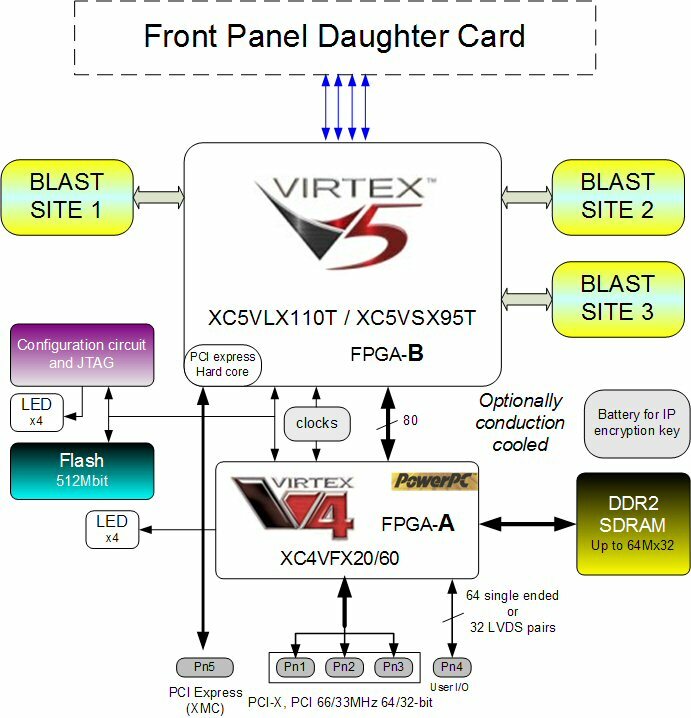 Custom BLAST™ modules may be defined to meet Customers Specifications, just about any logic that can be supported that require up to 100 lines of single-ended I/O from the Virtex-5. Two or more BLAST™ sites can be used to interface Customer Specific BLAST™ Modules, that may require up to 300 lines of single-ended I/O from the Virtex-5. NOTE: FM489 is configurable with 1, 2 or 3 of the following BLAST modules, mounted on BLAST sites (See Block Diagram).